Microsoft started rolling out a new feature for Skype on Monday: Skype Translator will translate communications from users using different languages in near real-time — that is, as you’re chatting. At first, Skype Translator will work with spoken English and Spanish, as well as forty written languages over instant messaging. To try it out, you’ll need a computer running Windows 8.1 or a current Windows Phone. You can sign up for the preview here. Users of Skype Translator will need to manually activate the feature for each person they speak to in order to hear their conversation automatically translated. The software will also provide an on-screen transcript of the call. Previous demonstrations have shown the software translating spoken German and offering translations in the user’s own voice, but those features are not available in the first preview. 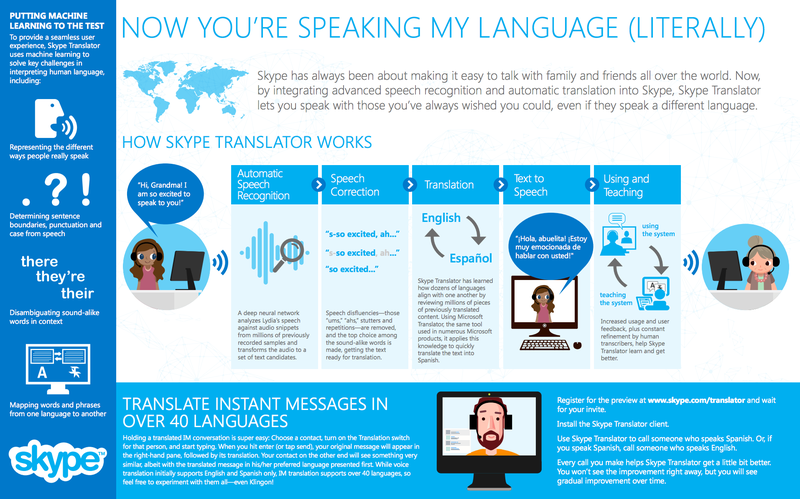 Microsoft has more information about how Skype Translator works on a technical level here. To start, Skype Translator appears to be aimed at schools. [company]Microsoft[/company] filmed an adorable promotional video depicting an American student based in Tacoma, Washington, talking to a Spanish-speaking student in Mexico City. But as any science fiction fan can attest, the potential applications of real-time translation go way beyond education. It could be invaluable for businesses that need to coordinate teams internationally, and the same technology has the potential to completely change the way tourism works. Skype Translator might not be good enough to totally rely on yet, but by signing up for the preview, you might help it get there soon. We have been following Chris Wendt’s visionary work at Microsoft since both Pangeanic and Microsoft are founding members of TAUS. Here are two existing technologies (voice recognition and machine translation) which are entering now maturity stage. The problem always was to combine them together as each statistical system introduces a % error margin. It was not long ago that we commented on Microsoft’s microsoft skype translator and assumed that the first test into German sounded a bit stiff. The distance between German and English is much greater than between Spanish and English. My guess is that cracking machine translation will come first. Adding voice is an add-on to the technology. How Microsoft plans to make money out of this remains the question.